I’m just popping on quickly to share a card with you, and then I really MUST get on with work. Because I have the luxury of being able to work from home, I can spread out my workload over the course of the week, however, I’ve put it off already and REALLY should be doing it RIGHT now… but you know what it’s like…cards are calling me!!! … I’m such a procrastinator!!! If I can just share ONE card, then I’ll happily go and do my work. *nods* I will, honestly!! Design by Julia. Stamped Images © Stampin’ Up! Ahhh, that’s better – I love my Vintage Vogue set and the matching Jumbo wheel; Very Vintage. I thought I’d age the card a little with some tearing and sponging… it just goes so well with this set. Stamps: Vintage Vogue, Jumbo Wheel – Very Vintage. 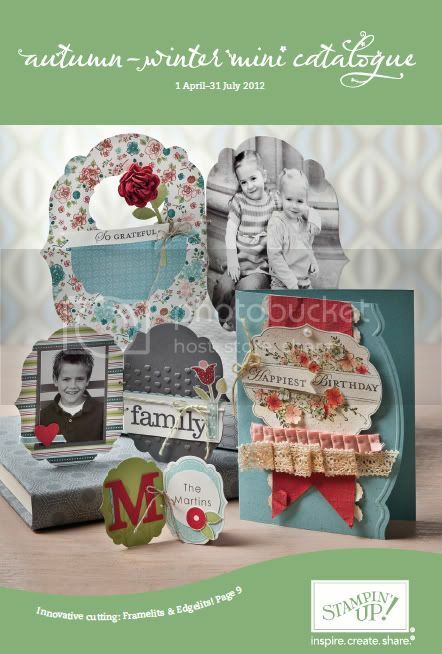 Cardstock and Paper: Riding Hood Red, Kiwi Kiss, Very Vanilla, Bella Rose Designer Series Paper. Inks: Riding Hood Red (stamped image on lower portion of card), Chocolate Chip, Close to Cocoa (sponging around the edges of Very Vanilla cardstock). Accessories: Chocolate Chip Taffeta Ribbon, button from own stash, Stampin’ Sponges. Another New stamp set from the mini. Ooooh, it’s so exciting! 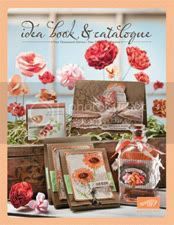 The NEW Autum-Winter mini catalogue is almost here!!! Ahhh, these colours are so beautiful to work with. I could play with them alll day long. The colours here are More Mustard, Creamy Caramel, Pumpkin Pie, Close to Cocoa, Chocolate Chip and Old Olive. This stamp set is called Vintage Vogue and would be perfect for all your shabby chic cards a scrapping. Here, I’ve teamed it with Baroque Motifs to build up the vintage layers. I’ve heavily layered the sponging and stamping around the edges of the Very Vanilla cardstock to increase the depth of colour to my satisfaction. I also stamped on Twill ribbon – but I’m sure there must be a knack to making the ink stand out better – I’d better practice some more! Here’s a Sneak Peak at a new stamp set from the upcoming Autumn-Winter Mini catalogue! WOW – I love this new mini!!! Keep checking back for some cards and a scrapbook page made with NEW stamps and colours!